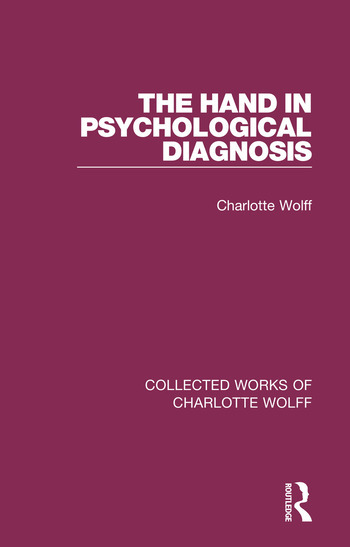 Originally published in 1951, this title looks at the study of the hand in relation to psychological diagnosis. This was at the time a new branch of psychology and the author is keen to point out it must not be viewed as perfect or indeed complete. Practical experience and a deeper understanding of psycho-motor phenomena had altered some of the author’s theoretical views since the earlier titles. This book builds on and extends her previous research, including new research studies particularly on children who were at the time termed ‘mentally defective’. It was designed to contribute some new diagnostic possibilities to psychology and psychiatry. Today we can enjoy it as part of psychology’s history. Introduction. 1. The Hand and Intelligence 2. The Endocrine Factor 3. The Hand and Temperament 4. The Hand and Personality 5. The Method of Hand-Interpretation 6. The Hand of the Mental Defective 7. The Hand in Mental Illness 8. Hands of Children: A Comparative Study of Hands of Normal and of Mentally Defective Children. Bibliography. Index.